I've started assembling my Prusa i3 kit. Ok you've had nearly 4 hours, what's the first print look like? Assembly takes quite along time... I spent two or three hours on it last night, and I've probably put eight hour in today. Some of it was correcting mistakes (mirror image assembly!) and a few things at variance with the instructions. Severally fiddly things were pre-assembled, that the instructions said you would have to do yourself. Now I've got to work up the courage to connect it up to 12 volts at 20 amps . Something that surprised me, was the effect of having two steppers wired in parallel for the z-axis. You turn one, and the other moves in unison! A problem I noticed with my slightly different version of the Prusa i3 is that the Z-axis screws are supported directly on the steppers. Apart from it being poor practice it locks the flexible couplings up. I hung the screws from ball thrust bearings at the top and get much smoother Z movement as a result. Neil,...what are you going to make with it please? I suppose you've seen this..? We've built three i3 so far, works very well. You could make some rough and ready angle blocks, or V blocks or how about a tachometer sensor holder and a push bolt to lock the spindle on an SX2 mill. Small square frame as a one off holder to cut a gear at an angle? Or a T=Rex or some runners for the sliding doors on a steel shed or some hinges for a shower screen or.... Insert endless list. The manual pointed out that if the motor shaft or threaded rods go into the flexible part of the coupling it will lock it as well. I was very careful to avoid this which is why the z-axis rods stick up so far - once all is working i will shorten them. I may go for decent acme threaded rods as an upgrade, also PGMS rods for x and y axes should give a smoother action. I've tracked down bearing carriers for the z-axis on Thingiverse. It seems an Ikea Lack table (£8) is just the right size to make a case! When I was fooling around with a Prusa some years ago, that double-drive z-axis arrangement was the thing that caused me most grief. If one motor loses any steps, it becomes quite problematic. It would have been better, I think, to connect the two z-axis leadscrews via a toothed-belt and to drive them from one (perhaps larger) motor. Some people fit a toothed belt across the top and lose one stepper. Hopefully that won't be a problem for me - my kit has larger than normal steppers and now I've swapper the Pololu over the z-axis seems to run very smoothly. I may upgrade to 2mm-pitch 8mm acme leadscrews. 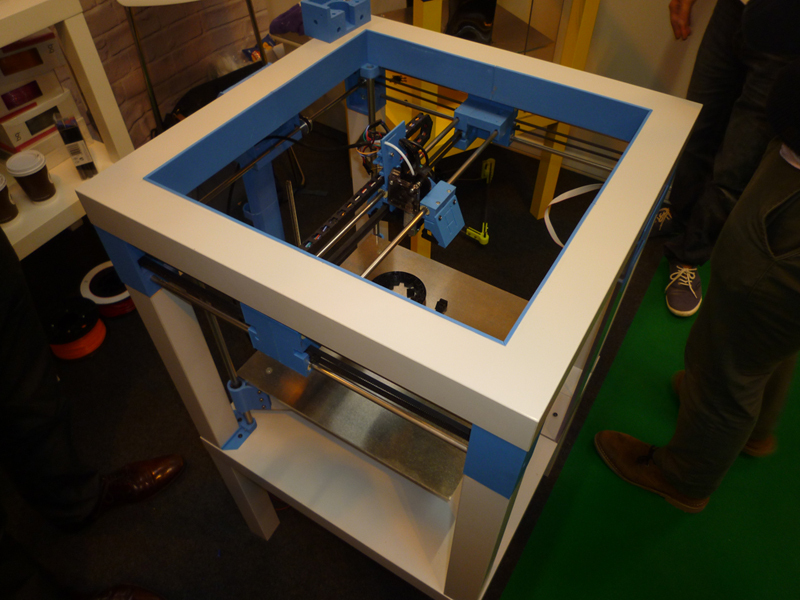 I saw these in action at last year's TCT show last year, pretty rigid for a very low cost printer. Posted by Neil Wyatt on 16/04/2017 19:35:14 ome people fit a toothed belt across the top and lose one stepper. I doubt if acme lead screws will make much difference. The load on the leadscrew is not very great and is in one direction (the weight of the x-axis carriage and extruder). It is worth making a decent brass nuts to fit the M8 screws though if yours use standard steel nuts. Also, as previously suggested taking the load on the top of the lead screws to enable the flexible couplings to work properly. Before I did that I could see the carriage moving slightly from side to side as it went up. The company that sells the kit I bought, Factory3D, say that they actually use these machines to print the parts they sell. I have to be 100% honest and say they quality is indistinguishable from the prints off the Dremel 3040D. They do stress that it does take careful setting up to get best results. One thing I noticed was that it's easy to get the Z-axis steppers at a slight angle, loading the flexible joint. They say they are planning to include a simple setting jig in future kits, but ho can do it easily enough with a square. I notice that Factory-3D don't seem to be selling these kits at the moment. Plenty of other bits and pieces but no indication of availability for the full kit. Seems quite a good price currently shown as £272 on the flyer which is still on e-bay store. 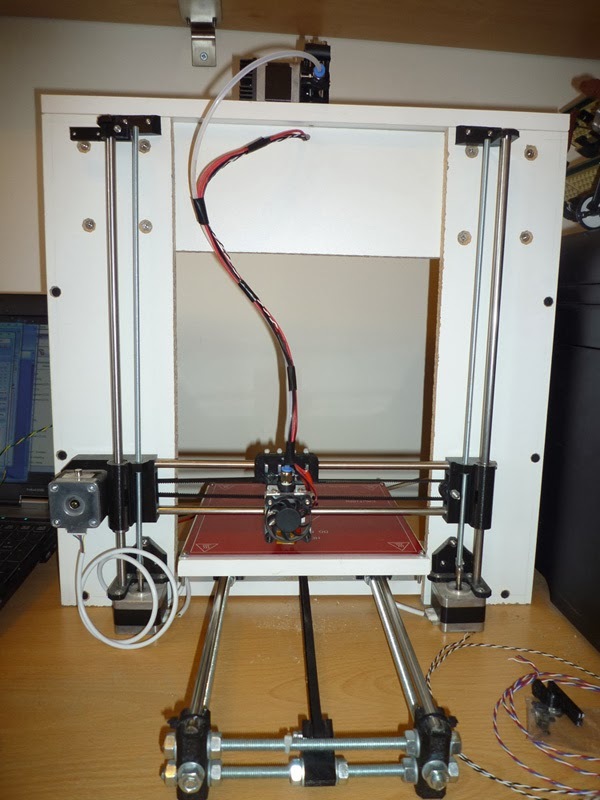 These printer kits seem to be available from about £150 up to £629 from Prusa Research. What should I be looking for in a good kit? I redesigned my i3 and swapped the orientation of the X axis stepper to allow me to use shorter belts. I have only ever used nylon tubing for my Z axis couplings and apart from one of them unscrewing itself on one occasion I have never had any issues with the Z axis. I added a tensioner to the X axis belt, as this was not easy to adjust as standard. I also switched to a Wades extruder from the bowden setup shown above. By far my biggest issue is with back EMF from the relay that switches my heated bed on and off, causing the X axis stepper to miss steps every so often. I use a Sanguinololu board (because they are dirt cheap) but they do not really have suitable traces for running a 10A heated bed, so I took the control off board. I use an Xbox 360 PSU for all power, I could probably resolve the issue if I split off the heated bed power from the stepper power with a separate PSU, but I can't be bothered at present, so I live with the issue. Aluminium frame, the larger steppers, 200W PSU and a decent build manual. Looks very neat, I have to get some more spiral wrap, I've run out! Well I got a pololu today and it works. I printed a few test pieces including a 'Benchy'. A couple of issues to sort - the lower layers are not cooling fast enough and curling up badly at overhung edges and corners, giving a poor finish. I think I need to use a cooler bed or adjust the fans on the extruder head. I also had 'stripping' nearly interrupt the benchy when it was printing five small areas at one. I think this is because somehow I had cura retreating the filament much too far - about 1cm! It was thrashing up and down and I think that's why the filament stripped. Also my first few layers don't seem to be printing too well. Where those problems didn't apply, the print quality is very good, if I can sort the curling issue I think I can equal the dremel print quality, but probably Sunday before I can spend some decent time on it. That said, the 'Benchy' appears dimensionally identical to one printed on the Dremel, so hopefully it will only take a bit of experimenting to get good results.